First-year Kenny Pickett wasn’t supposed to take a snap last year, much less lead the team to the biggest win of the season. 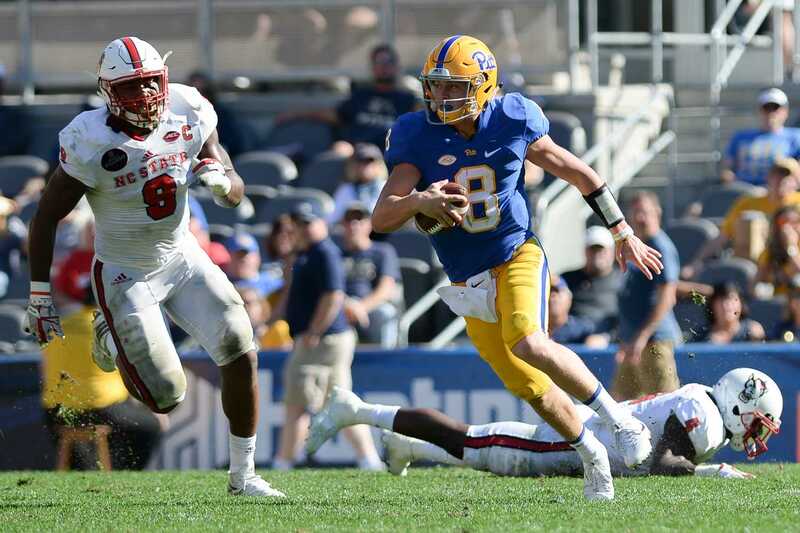 As the third-string quarterback for the Pitt football team entering the 2017 season, he was firmly entrenched behind redshirt senior Max Browne and sophomore Ben DiNucci. The expectation for Pickett as a redshirt freshman was essentially to sit back and learn in his inaugural season for the Panthers. Then Browne suffered a season-ending injury in a week five loss to Syracuse, which forced Pickett to effectively burn his redshirt status in order to become DiNucci’s backup. But DiNucci, despite being the hometown Pittsburgher and fan favorite, started to lose his hold on the starting job after several mediocre outings. Pickett found himself as Pitt’s starting quarterback entering the team’s final game of the season against the then No. 2 Miami Hurricanes. Pickett was instrumental in the Panthers’ 24-14 upset victory over the Hurricanes, completing 18 of 29 passes for 193 yards and a touchdown while also picking up 60 yards and two more touchdowns on the ground. The performance came as a surprise to mostly everyone — although Don Klein, Pickett’s former high school coach at Ocean Township High School in Oakhurst, New Jersey, knew Pickett was capable of great things. Pickett was a three-year starter quarterback for Klein. Over the course of his high school career, he amassed 4,670 passing yards and 43 touchdowns, as well as 873 rushing yards and 17 touchdowns. Pickett’s numbers caught the attention of college scouts, and he was rated the nation’s No. 10 pro-style quarterback by 247Sports.com coming out of high school. Klein recounts one of his earliest impressions of Pickett — not as pro-style high school quarterback with Division I upside, but as a nine-year-old kid who attended one of his summer football camps. Now, all eyes are on Pickett to use that same moxie toward improving the Panthers’ 5-7 record from last year — a challenge he’s looking forward to. For Pickett, the turnaround from backup to team leader in just one season is certainly an adjustment. Head coach Pat Narduzzi talked about the quick maturation of his young signal-caller. Pickett’s mindset is not the only thing that’s changed since the beginning of last season — he’s also made physical progress, entering spring camp at a full 15 pounds heavier than this time last year. And while it is true that Pickett will take on a greater leadership role as the starting quarterback, the burden is not solely his. The Panthers bring back a plethora of offensive experience, including the senior backfield trio of Darrin Hall, Qadree Ollison and George Aston — who missed most of the 2017 season due to injury. Despite the losses of Quadree Henderson and Jester Weah to the draft, Pickett should also have several talented receiving options at his disposal. Pitt will bring back its leading pass-catcher, redshirt senior Rafael Araujo-Lopes, while Pickett also singled out redshirt first-years Mike Smith and Darian Street as potential playmakers. “You lose one main guy in [receiver] Jester [Weah], but now we can spread the ball out to more weapons,” Pickett said. Aside from football, Pickett additionally talked about how he spends his brief free time when he doesn’t have to study class notes or the team playbook. But his predicted tournament champion, Virginia, was eliminated in the first round. While Pickett has proven to be a winner on the field — he has yet to lose as a starter — the same cannot be said for his bracket-making abilities.